Correct UX for the scenario when a user forgets the answers to their security questions? There was recently a scenario whereby a user forgot the answers to their security questions(!) and we had to re-register them from scratch which was quite cumbersome. What is the correct UX for the scenario when a user forgets the answers to their security questions? The correct UX approach is to disregard the long overdue pattern of so called “security questions”. Users tend to forget them as well, especially in terms of capitalization of answers. Instead you should provide a “forgotten password” link which sends a one-time link to the registered e-mail account where the user can provide new credentials. For your authentication mechanism (which, unless it's required by law, I see as paranoid) security question is equivalent and complementary to password. 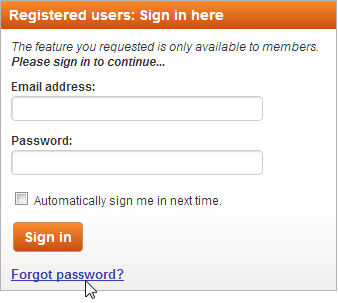 In this case you may rephrase your question to "What is correct scenario when an user forget her password?". Link must be temporary and can be used only once. Do not pre-fill new security questions with previous values. Consider to require them to also enter user name and/or some other code you're sure they already have. I have forgotten my security questions on occasion or found that the website offered me questions which I hadn't selected (so I couldn't answer) so effectively the same as forgetting! I thought to myself "Uh oh! What happens now?" The website in question asked me to authenticate myself in a number of ways if I remember correctly and eventually reset my security questions as part of this process, probably due to my not knowing/remembering the answers at least I would hope that it's because I didn't know the answers as it would be very irritating to reset security questions if a user only forgot their password! I cannot remember the exact authentication steps that got me back to safety but from the top of my head. ...and possibly email the selected questions (but not the answers obviously) back to them so they could refer to them later if needed. after (if) this was implemented a reminder prompt could inform the user to check their "selected security questions" email sent to them on such and such a date! Points 3 and 4 might be overkill though! Not the answer you're looking for? Browse other questions tagged security authentication or ask your own question. 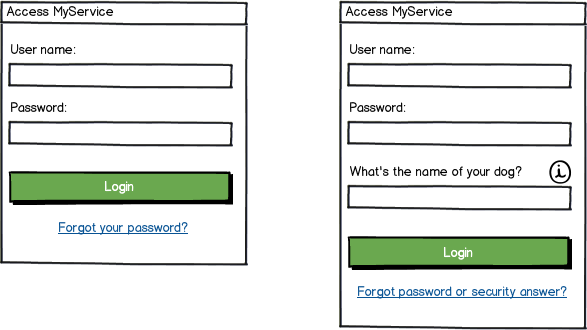 Usability and security for user access and password handling in a web application? Should my app send a confirmation email on user registration? How to handle “forgot password” when user has not confirmed email? Security questions vs secret password/passcode when logging in or retrieving login details?